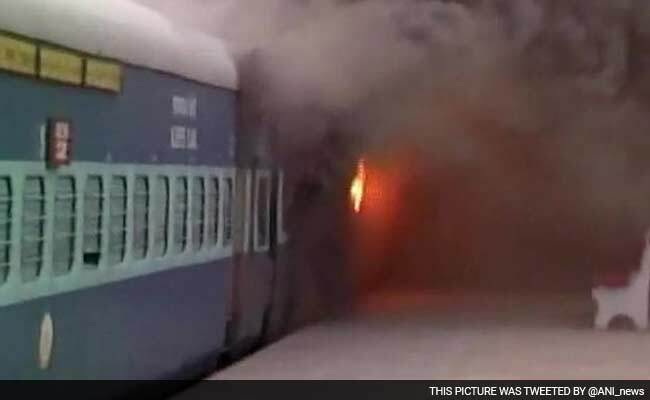 One of the three trains that caught fire at Puri railway station in Odisha. Puri (Odisha): A fire broke out today in three express trains at Puri railway station in Odisha, damaging at least four bogies, but there were no casualties, railway officials said. Some bogies of New Delhi-Puri Nandankanan Express and Tirupati Express were damaged due to the fire, but there was no report of injury, Chief Public Relations Officer of East Coast Railway JP Mishra said. The fire first broke out in coach No 11 and 12 of the Nandankanan Express shortly after it arrived at platform No 4 from New Delhi and the passengers had disembarked, he said. After a short while, fire erupted in the Tirupati Express which was on platform No 2 and fire tenders were called in to control the blaze, officials said adding there were no passengers in the trains. Thereafter, a fire also broke out in the Puri-Howrah Express which was scheduled for departure tonight, triggering successfully panic among passengers, they said. Meanwhile, Railway Protection Force personnel have detained a man on suspicion of his involvement in the fire incident. A high-level probe has also been launched into the incident and efforts are on to ascertain the circumstances that led to the fire, the CPRO said. Train services to and from Puri railway station had been suspended for the time being, he said. At least six fire tenders where called who successfully controlled the fire. Railway officials are also working on war footing to restore normalcy.